i have a ton of Christmas pictures, so i'll start from the beginning. 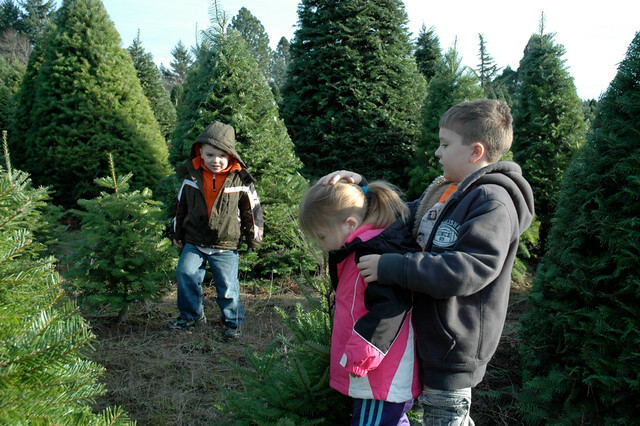 i think this is our 2nd year buying a tree from Zurbrugg Farms off germantown road, and i love it. we will definitely make this a tradition. reese was excited to find a tree that was just her size. and of course, maddox measuring to see if that was really true or not. lets just say he likes things to be accurate. 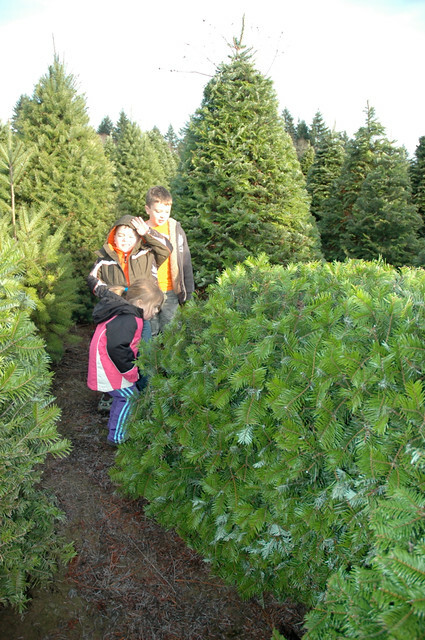 a great big 8 ft ish douglas fir. 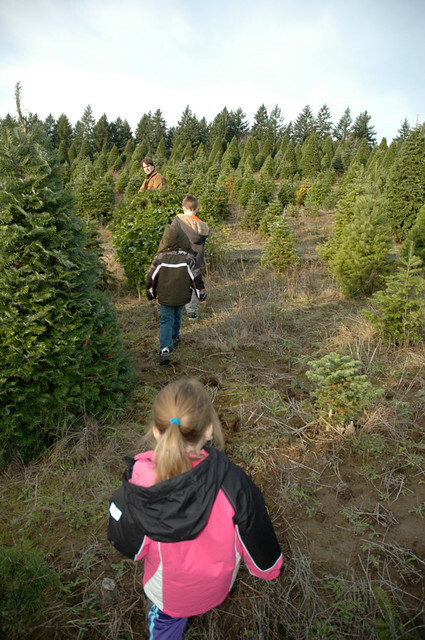 i do love a noble, but the big bushy oregon trees are just as nice in my opinion. 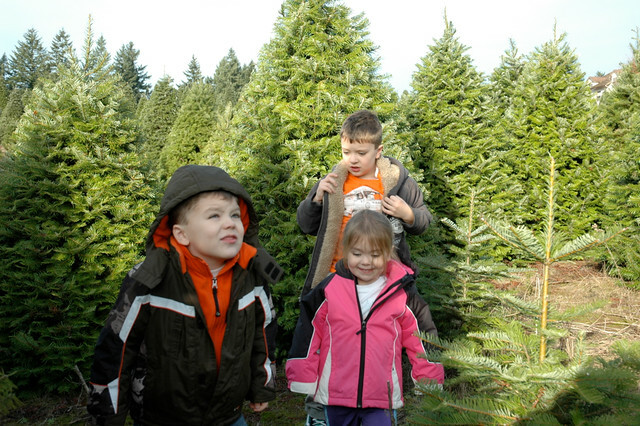 i have also found that the douglas fir trees are more forgiving when small children are decorating. aaron dragging the tree to the road. and judging by that look, i think i was supposed to be helping. but hey, i was holding a baby and a camera. someone needs to document these moments. besides, i don't decorate the back of the tree. so no big deal if there are a few broken limbs, right? i think this was the highlight of the trip for the kids. 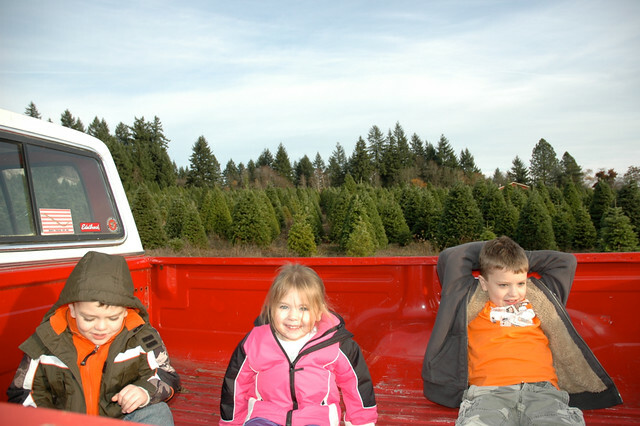 riding in the back of dad's truck 20ft up the path to find our tree and take it home. we learned our lesson last year after trying to lift and tie a 10ft tree to the top of the expedition. this year, shorter tree....back of the truck. MUCH easier. worth the extra gas to take 2 cars for sure. i'm pretty sure maddox said "ahhh, this is the life" as he sprawled out and made himself comfortable. and here we have some nice teamwork on display. 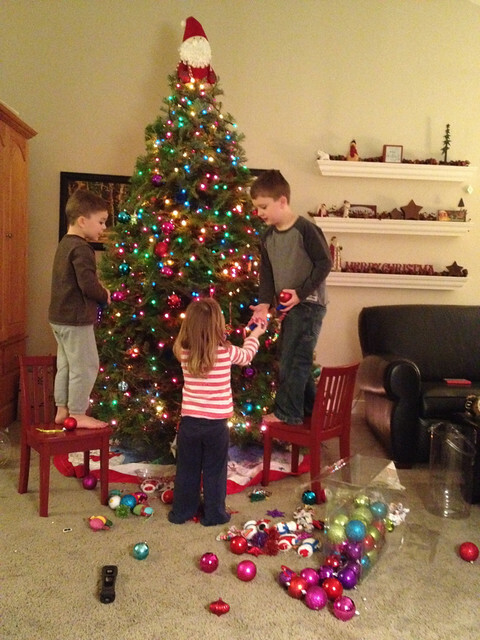 the "before kids" me would have placed every ornament equally spaced and dispersed. but, the truth is, with kids, it would stay like that for like 5 minutes so why bother. i just told the kids to go for it, and they did a great job. and i did a great job just letting it be. reese really liked the "girl" ornaments. i found a whole stash of pink & purple ornaments in her room stuffed behind some toys where mom was NOT supposed to find them. also included were the singing snowman and musical santa claus ornaments. it was so funny, i should have taken a picture. i think being the only girl, she is very possessive of her "girl" toys. if it's pink, it's hers. and if it's purple, it's hers. and if it's blue. it's NOT hers. She is also very possessive i mean protective of "her" baby too. see. 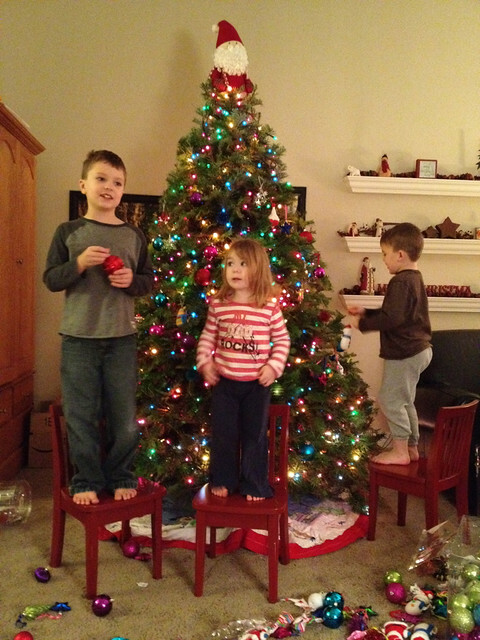 you can't even tell that 1/2 the ornaments are just wedged in. I love it, the kids are so cute. 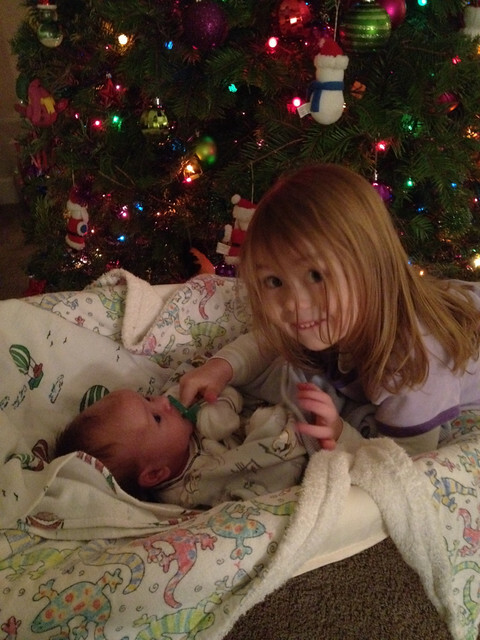 Christmas is for the kids & you are doing a great job letting them "help" !!! 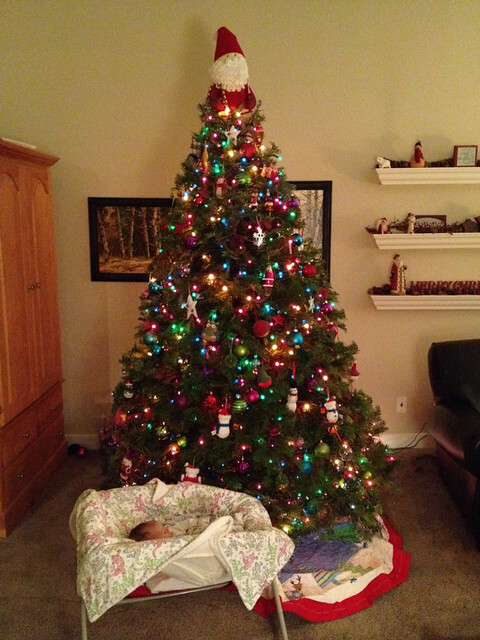 Harrison kinda looks like baby Jesus sitting under the tree. It's magical!!! oh, kids are great aren't they? such a great tree!